PowerPoint will allow you to run your slide show on your computer or as a 35mm slides or overheads projector transparencies. Your slides should summarise the key points. They should not become the script for your speech. Try and have one slide for every two to five minutes of your presentation. The best first slide to have in a presentation is one that captures the audience's attention. Try a provocative statement, a rhetorical question or an outrageous statement. Your presentation should present solutions to real problems. (View tab, Prompt to keep ink annotations when exiting) - (Added in 2003). Displays a prompt asking you if you want to keep or discard your ink annotations. 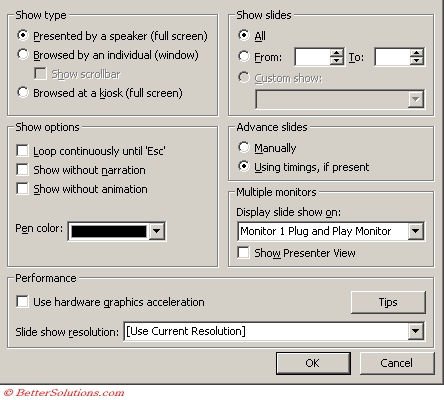 (View tab, Show menu on right mouse click) - Displays the Popup menu during a slide show when you right-click.. In PowerPoint 97, 2000 and 2002 this used to be the "Popup menu on right mouse click". (View tab, Show popup toolbar) - Displays the shortcut toolbar (or menu button in older versions) in the bottom-left corner of each slide during a slide show. In PowerPoint 97, 2000 and 2002 this used to be the "Show popup menu button". (View tab, End with black slide) - Displays a black slide as the last slide of your slide show. Clear this check box if you want to return to PowerPoint after the last slide of your slide show. It is possible to insert some background sound for your slide show. Select (Insert > Movies) and select (Sounds > Play CD Audio track). You can hide slides you do not want to show in a slide show. Tools > Hide Slide. Be sure you are in slide sorter view. When a hidden slide is next in line an asterisk appears in the slide window (bottom-right corner). Just click on the asterisk to display the slide (or press H). You may have to move the mouse slightly to make the asterisk appear. If you are showing a slide show you may want to run it from an icon on your desktop. Open Windows Explorer and find the file. Use the right mouse button and create a shortcut to the file and add it to your desktop. You can then right mouse click the shortcut icon and choose "Show"
You can temporarily turn the screen black during a slide show by pressing "B". When you activate the Custom Animation dialog box the items listed refer to the original objects. To animate an object, select it. You could have moving charts - just ungroup them and convert them to objects. Zooming - You can "Zoom out from screen". Note there is a size at which the animation will fail. Your presentation will start with the first slide displayed. To move to the next slide click your mouse. You can also use the arrow keys or Page Up and Page Down to navigate backwards and forwards. You can automate almost everything although you may prefer to initiate some action manually. The problem with using all automatic animation you are tied to the timing of the slide show. When allowing some flexible time for questions and comments you will want to able to trigger these manually. Right click the object. Choose Custom Animation > Effect tab. Click on timings and select the Animate and On Mouse Click button. Each slide show is a presentation but not every presentation is a slide show. Each presentation could be running as a slide show or in "edit" mode, a slide show is a "running" presentation. You can press (Esc) at any time during a slide show to cancel it. Make sure that everyone in the room can read the slides easily. Avoid putting too much text on any one slide.